What was envisioned as a perfect opportunity to raise awareness about one of Brazil's most imperilled species by making it the mascot for the World Cup has been a failure, say conservationists, and FIFA is to blame. 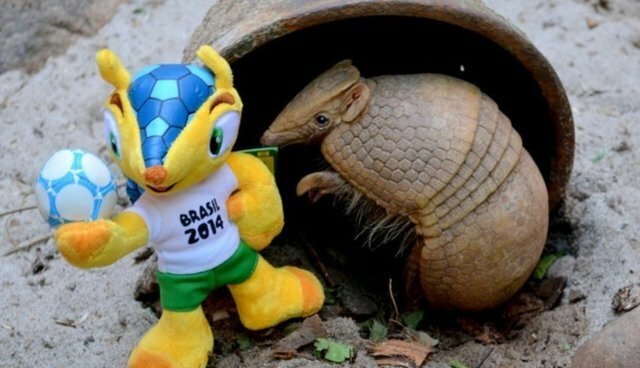 When it came time to picking the living symbol of this year's games, FIFA's selection of the three-banded armadillo came as a welcome news for environmental organizations, like Associação Caatinga, aimed at staving off their extinction. But instead of raising awareness about the species, the issue -- and the mascot itself -- has been ignored. "There's not even simple dialogue with [FIFA], which seems to have no interest in getting involved with issues in the host country. There is much to be critical of about the commercial exploitation of the three-banded armadillo to the international media with no return for the conservation of the species," says Rodrigo Castro, executive secretary from Caatinga. "It's not fair to Brazilian Society." Castro tells Globo News that FIFA has since offered to donate some of the profits from the game towards a five-year National Action Plan to bolster the armadillo's recovery, but their contribution would have amounted to less than 5 percent of the $2.75 million needed to enact it, so it was rejected as ‘insufficient.' By contrast, FIFA is expected to profit around $1.8 billion from the games. The species declined by 30 percent over the last several decades mostly due to habitat loss in Brazil's arid Caatinga and Cerrado regions. Conservationists say that unless more is done to protect them, three-banded armadillos could go extinct within 25 years.